We had interviews from Canada and from the USA, but we don’t stop to introduce the athletes from North America. Why? Because they are all very sympathic and have real passion for biathlon. Let’s talk now with the promising US talent, Susan Dunklee! BFH: Susan, let’s move back to the year 2008, your move to Lake Placid and the US Biathlon’s development program. It was only 5 years ago when you learnt how to shoot! How do you remember this time? Did you thought that you will need only 4 years to reach a top 5 position in a WCH (Ruhpolding, individual, 2012)? Susan: In spring of 2008, I was graduating college with a degree in ecology and I had no idea what I wanted to do with my life. Then I got an unexpected email from US Biathlon offering me a place on their development team in exchange for a 100% commitment to training. I had never shot before but they promised to teach me how. I had a difficult time deciding what to do. Ski racing had always been important to me, but in school I had pursued many other interests too. Concentrating all my resources and energy into racing was scary- I had to put aside those other interests. It was also exhilarating to try something new- I had no idea what shooting training would be like or whether I could do it well. My father, a two time Olympian in cross country skiing, gave me some great words of advice: "If you don't try it, you are always going to wonder 'what if?' " I knew he was right. I certainly never expected to be standing on stage at a World Championships awards ceremony less than four years later. BFH: What were your feelings after you crossed the finish line in that race? You started with bib nr 1: when you arrived you had to wait a long time to celebrate… Did you thought that your performance will bring you such a good position (which meant actually the best result ever by a US woman)? Susan: When I saw my name at the top of the start list the night before the race, I wasn't happy. Earlier in the week, I had been the very last starter in the sprint (bib 118). I normally prefer starting in the middle of the pack. However, starting first helped me get in the zone and ski my own pace. I knew I was shooting well, but I had no idea where I was ranked until the fourth lap. Skiing under a jumbotron I heard the announcer say "...surprise race leader so far, American Susan Dunklee..." My heart jumped up into my throat. All I could do at that point was just focus on putting one foot in front of the other. The last loop I was fighting for a medal and it was like skiing through a continuous tunnel of sound- the cheering had doubled in volume. At the finish I didn't know exactly where I would end up, but I knew that I had just had the best race of my life and that felt great! BFH: What were your best moments of your last season? Susan: For the second year in a row, my most memorable race of the season was the World Championships Individual. I wanted to have a magical day in Nove Mesto- the Ruhpolding result from the previous year was still fresh in my mind and this year the Individual was on my birthday. I shot well and was in the top 10 for much of the last loop, but I was too aggressive and crashed on the big downhill. I broke my custom rifle stock. It was very disappointing but things turned out okay. Even though I lost time and didn't finish in the top 10, I placed 15th and met US Biathlon's prequalification standard for the Olympic Team (2 top 15s). Anschütz and my coach helped me fix my rifle stock before the relay- we replaced the broken part with a piece of wood from a range broom handle. It was a unique and interesting project. I didn't miss any targets in the relay- the broom wood helped me "clean" my first World Cup race. BFH: Tell us a few words about Sochi: the course, the accomodation, the Olympic spirit… You (and also Annelies) did a great individual there! Susan: The Sochi course is not a typical World Cup biathlon course. It has bigger, tougher, more technical hills. Many athletes didn't approve of it. Our team approached the Sochi World Cup ready to adapt and to make that course "our course." I think that showed in our results. BFH: You wrote on your site: „Our women’s relay team achieved a top ten finish in 2013 and we know we are still capable of more. To do this, we need every individual performing at their highest potential. We push each other in practice all year long in order to bring out each individual’s best, and we know we must be there for each other during this challenging but exciting year. We are a strong team.” I am sure that this confidence in yourself and in your team will bring you a successful Olympic Games. You think even a medal is possible for you? Susan: On both our men's and women's team, I believe we have multiple people capable of medaling if they have a perfect day, myself included. Susan: We do cook on occasion and we always celebrate birthdays for all of our athletes, coaches, wax techs, etc. Last summer in Oberhof we borrowed Andrea's kitchen to bake a flourless chocolate birthday cake. Baking in Europe is often an adventure- for example the measuring cups are in different units than we are used to and there are no chocolate chips (an American staple) in the grocery store. We have to be creative. I think my favorite team memories come around the dinner table, especially in a place like Antholz where we all eat together around one big long table. Those meals are several courses long, so we have lots of time to get into deep discussions or just joke around. I always leave the dinner table feeling great because I have laughed so much. Susan: I had a busy April. I did some cross country ski races in northern California and got to race against top athletes like Kikkan Randall and Jessie Diggins. The US women's Nordic program has had incredible success the last few years and their results help inspire the biathlon team too. I find it is helpful to race and train with them on occasional. Then I went up to arctic Alaska to teach skiing to kids in an Inupiat Eskimo village through a program called NANANordic. The area is so remote that we had to fly in on a small bush plane because there are no roads. I stayed in a school for a week with other volunteer instructors. The kids loved the program- they were always happy to see us (we would get "death by hugging" first thing in the morning) and it was hard to convince them to take off their skis at the end of the day. While we were there, we tried all sorts of local foods like caribou, whale blubber and arctic swan. When that program finished, I traveled down to southern California for an Olympic media day in Hollywood. Coming from the arctic, that was a huge culture shock. It was hard to believe I was still in the same country. BFH: Where are you and what are you doing now? What is the training plan for the following couple of months? Susan: During the summer, I split my time training between Lake Placid, New York (site of the 1980 Olympics and head quarters of the National Team) and Craftsbury, Vermont (the ski club that I grew up in.) Every couple weeks, I switch locations. I like training in Lake Placid because the team and coaches are there, and the facilities are great. However, Craftsbury is home and it is my favorite place in the world. It is a small, rural village with farms, green hills, outdoorsy people and a great sense of community. I am part of a local professional team of skiers and rowers called the "Craftsbury Green Racing Project." In between training sessions, we work on projects promoting sustainability and endurance sports in our local community. It's important to have something meaningful to focus on besides training all the time. BFH: You wrote that in Nove Mesto „we were all very surprised by the number of spectators that came to watch the races- it felt a lot like Ruhpolding or Oberhof.” Do you have some special memories of the Hungarian fans? Maybe from your birthday? Susan: Yes, I remember the Hungarian fans are very enthusiastic singers. As I left the finishing pen, they called me over and sang Happy Birthday. Thanks guys, that was a wonderful end to a special day! 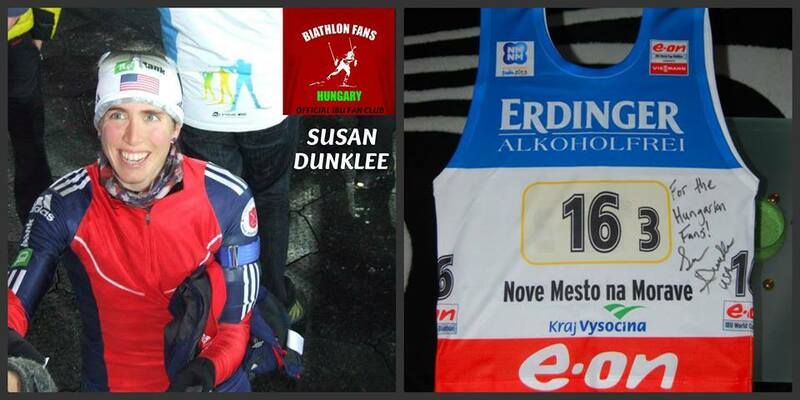 Thank you for your answers and the specially dedicated bib from Nove Mesto!!! We wish you all the best for the preparation!! !